So what was I up to all those days that I wasn't blogging last week? Working from home to meet an important deadline with Oprah on in the background. Yoga on Saturday morning once I was feeling better. Coffee and catch-up time with my friend Megan, whom I hadn't seen in months. Shopping and browsing to my heart's content in Gastown and downtown. I ended up coming home with a camel wool skirt from (212) that was marked down 70% and a T. Babaton black blazer and beige trench from Aritzia. Bumping into Alicia and having a great impromptu dinner date. Baking lemon ginger bundt cake for my coworkers. As you can see, I was too busy to think of an interesting outfit that went beyond the basics. Luckily for times like these, a bright colour, simple accessories, stripes, and dark denim make for an easy ensemble that looks pulled together. Sure, we have rain right now, but with sunny hues in one's wardrobe, spring is on its way, isn't it? Happy Friday everyone! What are you planning to do this weekend? This outfit is perfect. The end. I agree with Sal!!! You look great in yellow (there ARE people who can't really pull it off) and you already know how I feel about the bows on those flats! planning to take it east this weekend and watch a world cup final match at home. 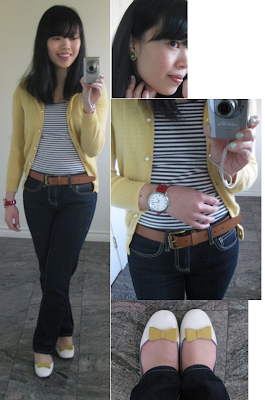 I love that yellow with the striped shirt. I would never think of that combo, but it's simply perfect! 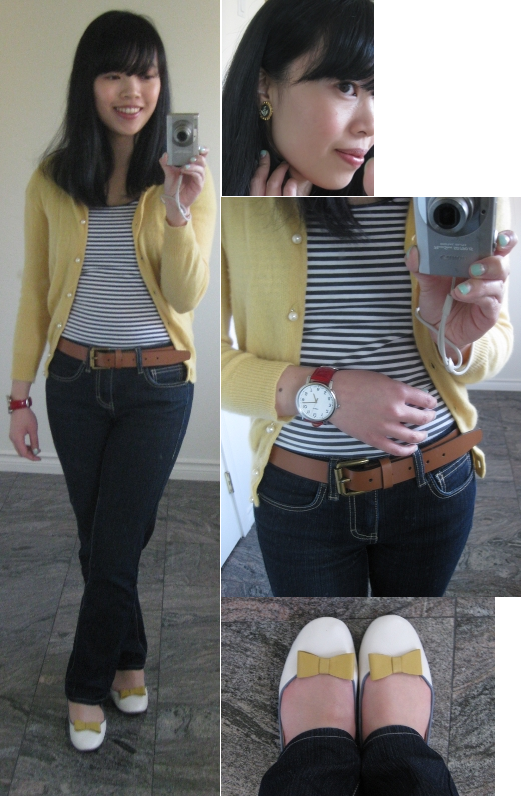 Love the bright yellow combined with stripes! I feel like you need a big tote with a baguette peeking out.